Down payment reduced to $100,000. Retiring owner will grant a qualified buyer a 120 month payout. This is a beautiful, established, profitable restaurant with an excellent reputation and $400,000 +/- of additional fixed asset and liquor license value. Revenue $635,110 (after deduction of sales tax) and profit $103,201. Landmark location on a busy street. Beautiful restaurant seating for 91 +/-. Bar seating for 51 +/-. The restaurant has 25 parking spaces and there is plenty of off-street parking. Seller owns the real estate & will give an excellent value long term lease with a bonus of the right of first refusal. Liquor sales 35% +/-. Food sales 65% +'-. The owner has the best possible buying procedures and contacts in place yielding an exceptionally advantageous cost of goods sold position. In addition, there is an attractive granite bar. Space: Restaurant and Bar 3,850 sq. ft on a ground level floor and 3,850 sq ft in the basement level. Attractive facilities furnished to match a top class restaurant. 3,850 sq ft on main floor and 3,850 sq ft in basement. Fully equipped with state of the art restaurant equipment and excellent storage. 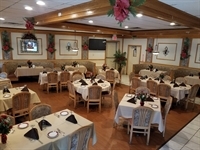 As a top quality restaurant enhanced by its excellent reputation the restaurant is enjoying growth. Owner will provide full professional transition support and guidance.